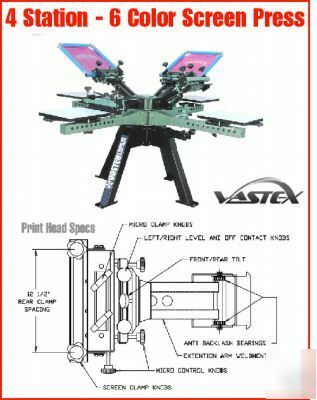 Vastex rules the industry with presses and dryers for textile screen printers. Quality equipment backed by the BEST warranties in the industry. Superior equipment designs based on over 40 years of experience. Expandable/upgradable printers that will grow with your business. Vastex printers have all steel welden construction, including the pallets. . .designed for printing garments with stunning precision. All parts are fabricated and completely assembled in Allentown, PA. No backlash print-head pivot bearings and tapered roller bearings and built around the largest center shaft in the industry. Dual ball bearings, located as close to the print head as possible, locking around a steel locator on each arm. Six way leveling of the print heads, micro-registration and massive steel screen back clamps. That is why Vastex Rules. we carry ever shape and size to fit your shops need! A PRODUCT MAKES ITS RECIPIENT FEEL. We leave positive feedback once you have done so. This let's us know we have done the job to your satisfaction. Please contact us, we can resolve any problem that may arise with your order. * If you do not see it in our store, email us, we can find it for you. * Returns are accept up to 5 days upon receipt of item. Simply return the item for a full refund if not satisfied with the product.